1.Either season your steak and grill to medium rare or medium. 2. Preheat your oven to 375° Season your steak and sear on all sides in a roasting pan. Roast in the oven to finish cooking to medium rare/medium (125-130 degrees). Meanwhile, make a simple vinaigrette with a little crushed garlic (or diced garlic scapes), red wine vinegar and olive oil. When your steak has finished cooking, set aside to rest but save the juices and bits in the pan. 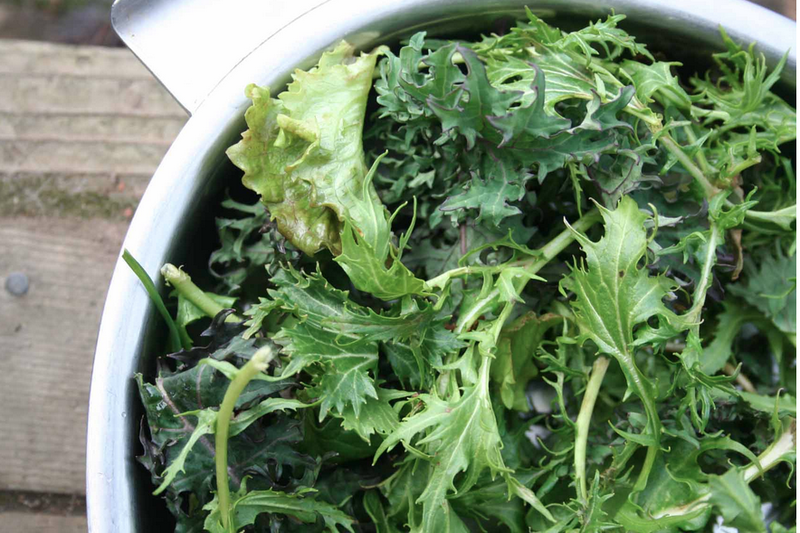 Have your greens ready in a large mixing bowl, and your vinaigrette made. Slice the meat across the grain and keep warm on a plate. Place the roasting pan back on the heat and, giving your vinaigrette a good stir, pour into the hot pan. Allow to sizzle and pour the hot dressing over your greens. Toss together and let them wilt a little with the heat. Taste for seasoning and divide between serving plates. (If the end result is too bitter for your taste, you may mix in some salad greens. ) Tuck slices of sirloin into the salad. Garnish with salsa verde and a bit of cheese. This can be luxuriously made by hand, in a mortar and pestle, by pounding and rolling the herbs and garlic into a paste, then removing contents into a bowl and binding with olive oil. –or- quickly, by doing the same process in a food processor. Either way you choose to do it, incorporate enough oil to bind it all together and drizzle from a spoon. Drizzle over your salad. Not Included in Large Real Food Boxes: Salt, Pepper, Red Wine Vinegar, Olive Oil.